Just discovered LinkedIn InMaps today. A good example of interactive information graphics that can lead to discovery. Interesting to find the connections that bridge groups. Like the “I didn’t know Tony knew Larry!” moment. 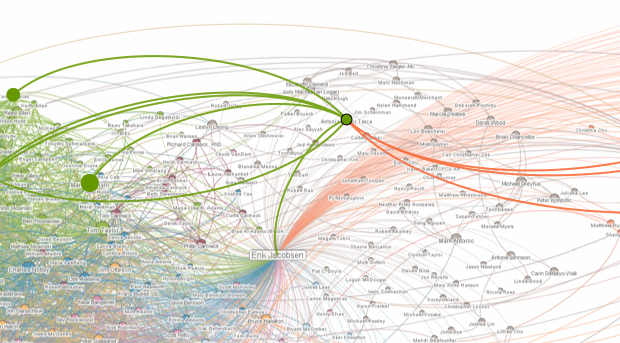 This fact would have been discoverable just browsing through my connections on the standard LinkedIn site, but seeing the whole network mapped in one place removes a lot of barriers to this kind of discovery. The zoomed-out view shows an accurate picture of my circles – the smaller clearly defined orange is a networking group I’ve been closely connected to for over a dozen years, the dense multicolored cluster opposite are my various church connections, with family mixed in. In between are various work and school connections that are scattered and less well-defined. It’s not hard to create your own. Try it here. I’m curious to see what other people’s networks are shaped like.